Home DIY Projects	How to Recover a Padded Headboard! Happy Monday, friends! Do you have a dated headboard in need of a little pick-me-up? 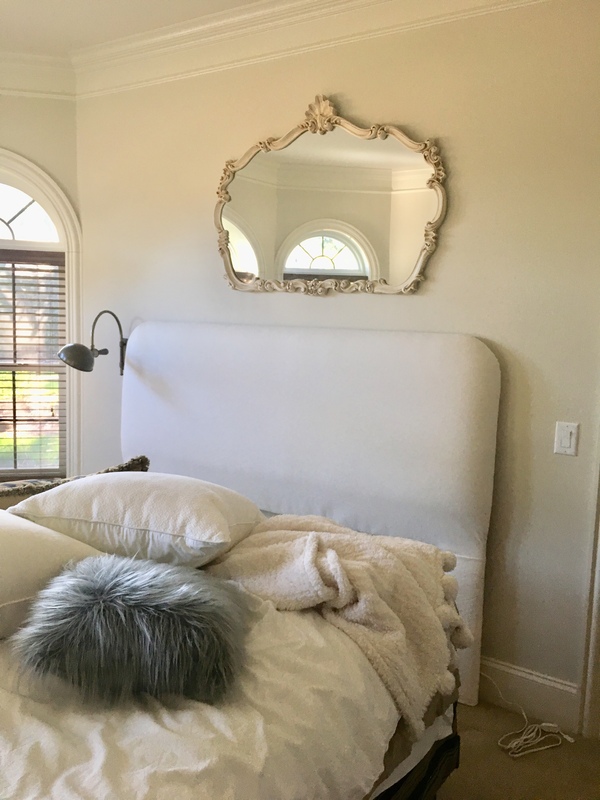 Well, grab your staple gun and a cup of coffee and I’ll show you how easy it is to recover a padded headboard in just a few hours! Earlier I shared with you the beginnings of the makeover of our guest bedroom and bathroom. (To read more about that see here: Guest Room Make-Over!) Once I finished painting, I decided to change the look of the existing headboard. Here’s where I started. The headboard belongs to a king-size bed and is very simply made. There are no sharp edges, shapes and no buttons or tufting, so I knew it would be a pretty easy project and one that I could handle myself. Years ago a friend and I took a very basic upholstery class, so I drew upon a few lessons I learned. Because I was doing this alone, I propped the headboard up between a wall and a doorway. This way I could see it from both sides, front and back. I decided not to remove the old fabric, but just cover it. I had some pretty ecru linen in my stash from a previous project. But, I knew the colors of the existing fabric would bleed through. Out of necessity, I had to cover the entire headboard first with a thin white lining fabric, then cover it again with the linen fabric. Double the work, but worth it not to remove the old fabric. However, if you decide to remove the old fabric, take it off carefully and use it as a template. First, I covered the entire headboard in white drapery lining running the fabric the length of the headboard. I made sure the fabric was even all across the top of the back side of the headboard. (The selvage edge is on the top and bottom of the headboard.) It took about 3 ½ yards of lining. Then, I stapled the lining to the back of the headboard all the way across slightly below the original staples. Pulling the fabric underneath the bottom of the headboard I tacked a few staples in place to hold the fabric tight and in place. I cut two slits to allow for the legs. I stapled the sides, making sure the fabric was taut across the front and then trimmed the excess fabric. Make sure you leave yourself plenty of fabric to work with, since you can always cut off extra. Lastly, I tackled the corners. I gathered the fabric in my hands and pulled it tight, trying to smooth out wrinkles as I went. It’s really an eye-ball kind of thing. Keep playing with the fabric and folds until it looks good. Then staple it into place. Use plenty of staples! Trim off the excess fabric and use a hammer to tack down any staples that may not have gone in all the way. Don’t be shy about using a ton of staples. You want the fabric to stay in place! Finally I cut 2 pieces of the lining to wrap around the legs. I folded over the top and bottom so there was a clean edge visible and stapled it into place. I probably used a few hundred staples! This is how the corners looked after I stapled the lining in place and trimmed the excess. Follow the exact same steps using the top fabric, in my case, linen. This really is a learn as you go type of project. I tried to follow how the headboard was put together originally and used that as my template. Because I am doing this for myself, it doesn’t need to be perfect. Plus, no one will ever see the back of the headboard but you and me! If there had been tufting or something more intricate, I may have hired out this project. But, after doing the lining portion, the top fabric went on quickly, once I knew what I was doing! Here is the finished product! There are a few wrinkles around the bottom of the headboard, but once I get the bed back into place and dressed with pillows, no one will be the wiser! I slid the headboard back into place and put it back on the wall cleat to secure it to the wall. This is the last project for this room. (I think.) Hopefully over the next few days I can get my husband to help me put the furniture back in position and then I can pile on the pillows and blankets! I love how much lighter and brighter the guest room looks now with a fresh coat of paint and a “new” headboard! And because I love a good before and after picture, here it is! I plan on adding some color with the bedding and accessories, but for now the hard work is over! My goal is for the guest suite to have a hotel-like vibe. And as easy as that, you too can re-cover a padded headboard! Really and truly this is a simple DIY project. If you are intimidated, have a creative friend or family member give you a hand. And if you mess up, just pull out a few staples and re-do it. The cost of making over this headboard was zero since I had everything on hand from previous projects. I’m a firm believer if you think you can do something, you can! Have you tried an upholstery project? How did it turn out? Please share your experiences! I’d love to hear about it! How to Clean and Paint a Chandelier! A Simple Cake Plate Facelift!